Great for keeping your home clean, this ash bucket will allow you to remove messy ashes without a mess. Ash buckets feature a double bottom for insulation from hot ashes. 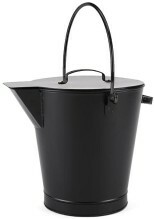 Secondary uses for this item include coal hods, pellet bucket, or even a seed bucket. Sold in two styles; all black (ASH-01) or black with solid brass handles (ASH-02). Both styles feature a cover and two handles for easy maneuverability.